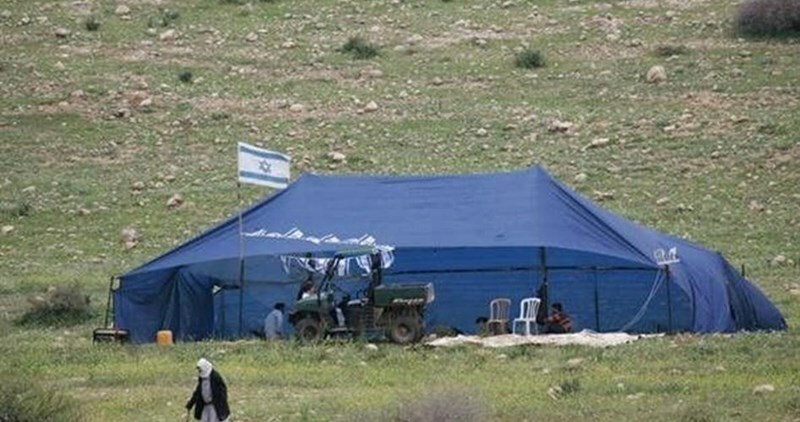 A horde of Jewish settlers on Saturday evening pitched a large tent on a mountainous hill overlooking Beit Furik village, east of Nablus. Eyewitnesses told the Palestinian Information Center (PIC) that the settlers stayed in the area until Sunday morning local sources have voiced their concern over settlers' attempt to establish a new settlement outpost on this hill, especially since they already carried out activities and performed rituals on it. In a separate incident, the Israeli occupation army said its forces arrested at dawn Sunday two Palestinians affiliated with Hamas after raiding their homes in towns in Ramallah and al-Khalil provinces. According to the army, one of the detainees is from al-Mazra'ah al-Qibliya town, northwest of Ramallah, and the other from Surif town, north of al-Khalil. The Israeli occupation forces (IOF) also handed a young man named Ibrahim Thawabteh during a dawn raid on his home in Marah Rabah village, south of Bethlehem, a summons for interrogation from the Shin Bet in Etzion military base. The Israeli occupation forces (IOF) on Saturday evening kidnapped three Palestinian citizens at checkpoints in al-Khalil and Nablus provinces. 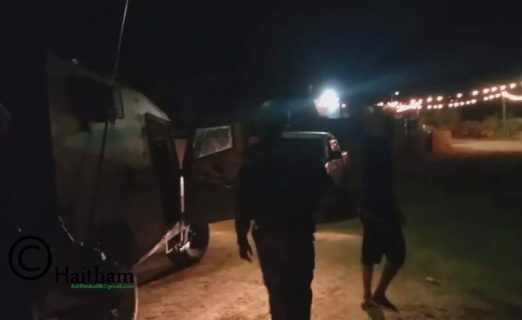 Local sources said that the IOF kidnapped two young men at the entrance to al-Fawwar refugee camp, southwest of al-Khalil, and took them handcuffed to an undeclared place. The detainees were identified as Omar Abu Fedda and Shahab Abu Samada. Israeli soldiers also kidnapped an unidentified young man at a makeshift checkpoint on a road to the northeast of Nablus. Eyewitnesses reported that Israeli troops intercepted a public vehicle on al-Badan road and forced everyone aboard it to step out before rounding up the young man and driving him away. Soldiers also detained several young men in Huwara town, south of Nablus, and searched them before releasing them. In Jenin, the IOF set up a makeshift checkpoint near Araba town and obstructed the movement of Palestinian citizens and vehicles, with no reported arrests. Several military barriers were also erected on roads in different areas of southern Jenin, where Israeli soldiers embarked on intercepting passing vehicles and searching and interrogating citizens. Earlier, two brothers were taken prisoners during separate dawn IOF campaigns in Qalqiliya and Nablus. Palestinian prisoner Sa'ied Musallam, 42, has suffered health complications following his transfer from Soroka hospital to Ashkelon jail. Prisoner Musallam had undergone surgery after he suffered a heart attack last Monday in Negev jail. According to the Palestinian Prisoner Society (PPS) on Saturday, the Israeli prison authority transferred the prisoner again from Ashkelon jail to Barzilai hospital after a sharp decline in his health condition. Zakariyya Abu Bakr, the head of the Fishers Committees of the Union of Agricultural Work Committees said the kidnapped fishers have been identified as Rasem Ishaq Zayed, Mohammad Ishaq Zayed, Saqer Younis Zayed, Ayman Younis Zayed, Khaled Mahmoud Zayed, As’ad Mohammad Sultan, Mohammad Mahmoud Sultan and Ayman Mahmoud Sultan. The fishers, who were kidnapped in the second attack, have been identified as Ahmad Mohammad Zayed and Ibrahim Zayed. They were all taken to an unknown destination, after the navy towed their boats. The attack is part of repeated Israeli violations against the fishers in the besieged coastal region, in addition to its attacks against Gaza farmers and workers, in Palestinian lands close to the border fence. 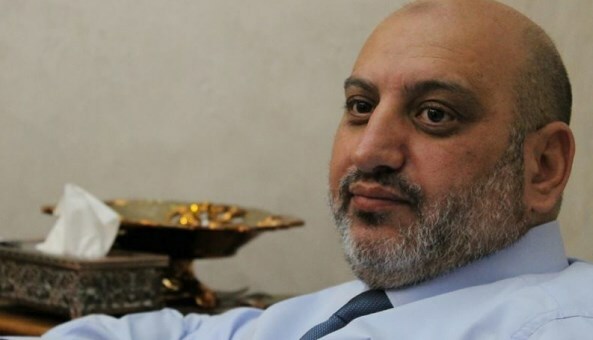 The Israeli Occupation Authorities (IOA) renewed Friday the administrative detention of the former minister Issa Jabari. According to PIC reporter, Jabari’s administrative detention was renewed for three additional months for the second consecutive time. Jabari was arrested on January 2016 and sentenced to four months in administrative detention. He spent nearly ten years in Israeli jails, including seven years in administrative detention according to which hundreds of Palestinians are held without charge or trial. The Popular Committee against the Wall and Settlements in Bil’in, near Ramallah, said that testimonies by Israeli soldiers against nonviolent activist Abdullah Abu Rahma, are contradicting each other, while the prosecutor keeps pushing for his continued detention. Abu Rahma was kidnapped several days ago during a nonviolent protest marking the Palestinian Nakba, in Bil’in village, west of Ramallah, and was sent to court on May 17, when the judge said that he should be released instantly despite the prosecutor’s demands. The judge stated that the two soldiers, who provided false testimonies, should be the ones behind bars, and recommended investigating them, although he did not issue a warrant for their arrest. But, the prosecutor had a different opinion, and called four additional soldiers to testify against Abu Rahma, in an attempt to increase the pressure and ensure his continued detention. Abu Rahma family said the Israeli prosecution demanded holding him under interrogation for eight additional days, but the judge granted them one day. The third court session was held on Thursday, October 19, and the prosecutor presented a case that lacked any real indictments, yet, supported by soldiers’ ‘eyewitness’ testimonies, that made no real sense. The judge then ordered Abu Rahma’s release and set a 15000 Israeli Shekels bail, but the prosecutor appealed and asked for additional 72 hours. Dr. Rateb Abu Rahma, media coordinator of the Popular Committee and Abdullah’s brother, said the prosecution described Abdullah as a person who “constantly violates law and order,” through his continued activities, and described him as a central figure in them. He added that when the soldiers kidnapped Abdullah, it was during a sports activity in the village, and not even during one of the legitimate nonviolent protests, and that the soldiers assaulted and beat him continuously. Lawyer Hafeth Bornat, who attended all sessions, said the lawyers who represented Abu Rahma managed to prove, including through videos, that all of the allegations are false, and that his abduction and imprisonment are illegal, but still, the prosecutor appealed. The Popular Committee against the Wall in the West Bank strongly denounced the ruling to keep Abu Rahma detained, and described it as a political, racist ruling targeting all nonviolent popular resistance activists, part of Israel’s continued efforts to silence this resistance that exposes the true face of the illegal occupation, and its apartheid policies. 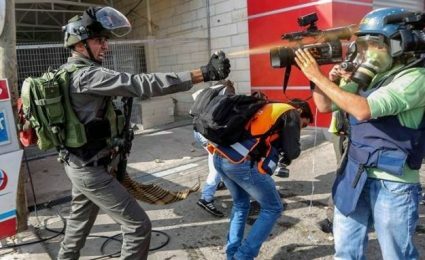 It demanded European officials, and representatives of local, regional and international human rights groups, operating in Palestine and Israel to attend the Abdullah’s upcoming court session scheduled for this Sunday, May 22, in the Ofer Israeli prison near Ramallah, at three in the afternoon. The Popular Committee said Abu Rahma is a human rights defender, and that the Israeli attempts to keep him imprisoned are direct violations of International Law, and are part of Israel’s ongoing harassment and abuse of human rights defenders. It is worth mentioning that that Joris Van Winckel, the European Political Affairs Officer – EU representative, a number of peace activists and the immediate family of Abu Rahma, attended the latest court session. After obtaining the coalition's support of his capital punishment legislation, the Yisrael Beytenu will have to concede several other issues close to his heart, including religion and state. Yisrael Beytenu leader Avigdor Lieberman has noted several significant achievements in his talks to join the government, particularly in defense and immigration, but his party will still have to compromise on quite a few other issues that it has thus far defined as "principal." Because of the makeup of the coalition—which includes religious parties Bayit Yehudi, Shas and United Torah Judaism—Lieberman will have to make concessions on issues of religion and state that would no doubt rile up the ultra-Orthodox parties. This means that once again, Lieberman will not be able to promote new legislation on Jewish conversions and civil unions. He will also not be able to push legislation on the drafting of ultra-Orthodox men to the IDF or on canceling marriage registration districts (allowing couples to register for marriage wherever they choose, which will make the process easier). In return for these concessions, however, Prime Minister Benjamin Netanyahu has agreed to throw the coalition's support because Lieberman's proposal to impose death sentence on convicted terrorists. The controversial bill has gone up to a vote in the current term and failed due to objection from the coalition. According to the legislation, capital punishment will only apply to Palestinians and could only be given by military courts. Jewish and Arab citizens of Israel—even if they reside in the West Bank—will be tried at civilian courts and the death penalty will therefore not apply to them. Lieberman is also seeking to make it easier on military courts to sentence convicted terrorists to death - by changing the military court's orders to allow a majority of just two, rather than three, judges to dole out the death sentence. In addition, the defense minister will have the authority to implement a policy of capital punishment to terrorists. However, the legislation might still face obstacles as Attorney General Avichai Mandelblit, like his predecessors, is expected to object to the bill. Less than a year ago, Mandelblit's predecessor Yehuda Weinstein determined such legislation does not lead to the desired deterrence, as terrorists are already willing to sacrifice their life while carrying out the attack. Officials in the justice system pointed to other issues the legislation could face. Firstly, it goes out against international trend to cancel capital punishment, which could lead to harsh international criticism. "Two thirds of the world's states, including in the European Union, have eliminated the death penalty," former AG Weinstein wrote in his legal opinion last year. Secondly, there is concern of committing an "irreversible error": in the past, people were executed only to be found innocent later. Finally, the legislation can also encounter constitutional obstacles, as it contradicts Basic Law: Human Dignity and Liberty. Israeli law includes a small amount of offenses that could lead to the death sentence, including the Nazis and Nazi Collaborators Punishment Law, treason, and offenses in military law. But most of these are leftovers from the British Mandate period and the 1992 Basic Law: Human Dignity and Liberty essentially "cancels" such legislation. Likud officials clarified on Thursday night, however, that "this isn't an issue that could thwart the agreement between the two sides." 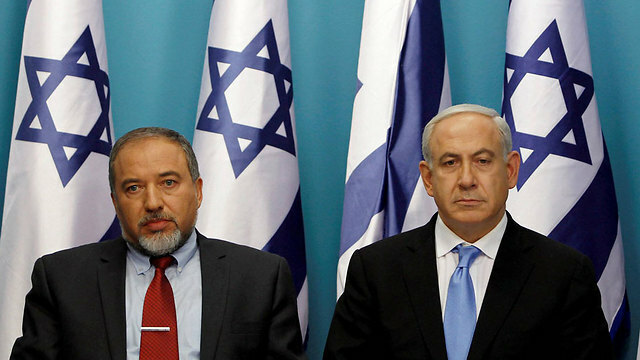 In addition, Netanyahu worked on Thursday to quell the objections to Lieberman's appointment as defense minister, saying in private conversations that he would be a "pragmatic and moderate" defense minister, and that the Yisrael Beytenu leader supports regional diplomatic moves. As part of its coalition deal, Yisrael Beytenu will also receive the chairmanship of one of the Knesset's committees, an MK serving as the deputy Knesset Speaker, a representative in the ministerial committee on legislation, the establishment of a cabinet on immigration, and representation in the socio-economic cabinet. In addition, Lieberman received assurances from the prime minister that the work on the pension reform for new immigrants will continue and be completed. While Lieberman himself will be appointed defense minister, the Immigration Absorption Ministry will be given to his close ally Sofa Landver, who has served in the position before. The signing of the coalition deal with Yisrael Beytenu will lead to a cabinet shuffle. After giving the defense and immigration portfolios to Lieberman, the prime minister will have to find an alternative job for outgoing Immigration Minister Ze'ev Elkin. Outgoing Defense Minister Moshe Ya'alon has quit the Knesset and announced he was taking a hiatus from political life, which means Netanyahu will no longer have to find an alternative for him. Netanyahu still holds several portfolios: the Foreign Ministry, the Economy Ministry, the Communications Ministry and the Regional Cooperation Ministry. One of the options the prime minister is examining is offering Elkin a limited Economy Ministry including just industry and trade, after Welfare Minister Haim Katz demanded to return authority over labor to his own ministry. However, it is also likely Netanyahu will find an entirely different role for Elkin. 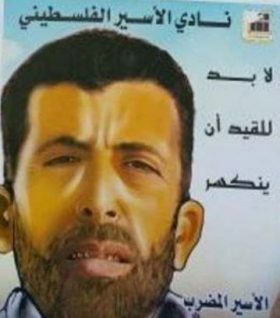 The Palestinian Prisoner Society (PPS) said that the Israeli prosecution decided to file an indictment against prisoner Sami Janazra, who has been on hunger strike since early March in protest at his administrative detention. According to senior PPS official Jawad Boulos, prisoner Janazra will be indicted for inciting violence. 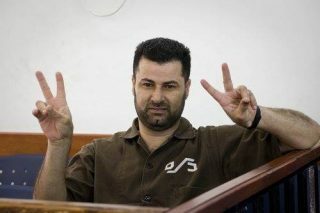 The prisoner was taken on Thursday to the military court of Ofer to extend his detention until next Monday. The higher court is also expected to revoke the administrative detention of the prisoner before looking into the indictment filed against him. 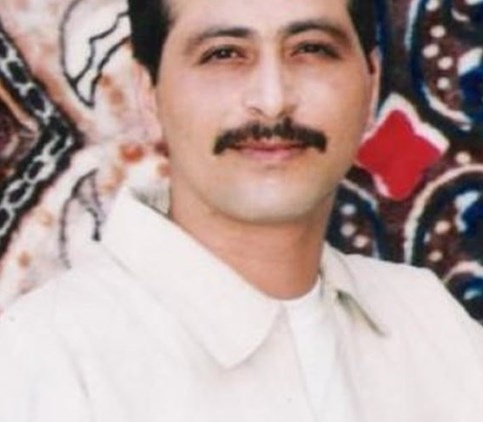 The Palestinian Prisoners Society (PPS) has reported that detainee Sami Janazra resumed his hunger strike, Wednesday, after suspending it for several days. The detainee went on strike for 70 days, protesting his arbitrary Administrative Detention, without charges. The head of the Legal Unit of the Palestinian Prisoners Society (PPS), Lawyer Jawad Boulos, said Janazra suspended his strike after the Israeli prosecution asked the High Court to grant it seven days “to continue the interrogation” of the detainee. He added that the Israeli prosecution claimed it intends to open an investigation after alleging “it obtained new information regarding his case”. Boulos also stated that he demanded the Israeli court to voide the Administrative Detention decision against Janazra so that he can have his day in court, adding that the detainee has the right to defend himself and be represented in court, instead of being held without charges. When Janazra paused his strike a week ago, he only took liquid foods, and said that he will resume his strike the moment Israel renews his Administrative Detention. Janazra, from the al-Fawwar refugee camp, south of the southern West Bank city of Hebron, started the hunger strike on March 3, 2016, protesting his continued Administrative Detention. 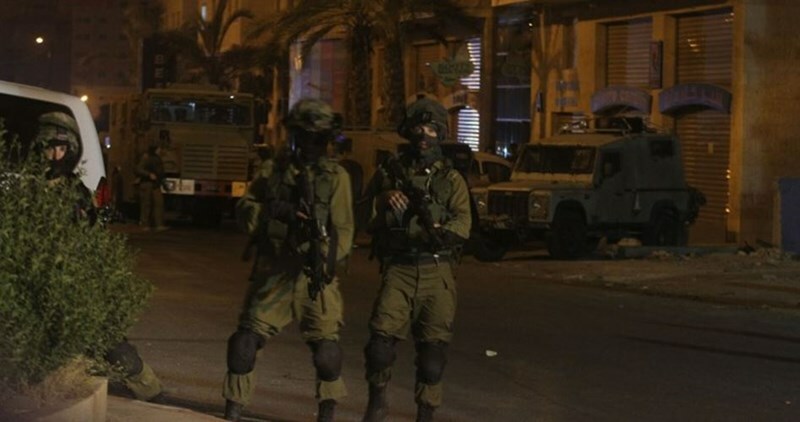 Israeli soldiers invaded, on Thursday evening, the village of Bil’in, near the central West Bank city of Ramallah, and stormed the home of an elderly couple, before summoning one of them for interrogation. Cameraman Haitham Khatib, who filmed the invasion, said on his Facebook page that the elderly couple are 65 and 70 years old, and that their home is close to the Annexation Wall, built on Palestinian lands. Khatib added that the soldiers, and border police officers, only summoned the elderly woman for interrogation at the Ofer Prison. He also stated that this latest attack is very troubling, as the Israeli army now seems to be trying to intimidate and imprison elderly Palestinians in the village, in an attempt to stop the ongoing weekly popular nonviolent protests, against the Annexation Wall and colonies, in participation with dozens of Israeli and international peace activists. Bil’in has been a leading village in the ongoing, popular, nonviolent struggle against the Annexation Wall, and has been a frequent target of invasions and assaults by the Israeli army, while dozens of its nonviolent activists have been kidnapped and imprisoned. Several Palestinian activists have also been killed by the army.